A bridal shower checklist is a list of tasks to be completed on, or just before, the day of the event. This will help keep you on track and organized. It can be very helpful in eliminating any last minute unnecessary stress. . Prepare one ahead of time. Then, as the party gets closer, go over each item. Mark off as "completed" anything that you have already accomplished. • If this is a surprise wedding shower, have a plan in place to get the guest of honor to the party. • Have directions to the party location written down, in case a guests needs help. • Have someone ready to greet the guests. This is typically the hostess or a member of the bridal party. It may be necessary to have an additional person or persons, outside the location, to tell them where to park. • Are many of those attending the party, meeting for the first time? Consider using name tags. You may want to have a special color or design for the bridal party. This would make them easily identifiable. • Keep a guest list nearby, with each person's name and phone number. • Make a list of all bridal shower decorations. If you need help with decorating, ask ahead of time. Your location may allow you to set up the night before. If it is necessary to decorate the day of the event, have enough time blocked before the party. This should all be finished before the first guest arrives. • Have plates, cups, napkins and utensils ready. • Next on the bridal shower checklist is to check on the menu. Have someone assigned to refill snacks, buffet items, etc. • Have all items ready for bridal shower games...paper, pencils, cards, etc. • Music to complement your theme is a great bridal shower idea. You may want to include some of the bride's or couple's favorite songs. If you are playing cd's, have them stacked to play for the duration of the shower, or have a person ready to attend to this. • Have someone in charge of taking pictures, or have some disposable cameras and ask guests to take candid shots. 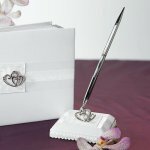 • Your bridal shower checklist should include a gift helper. This person will write down each gift, and who gave it. This makes it easier when "thank you" notes are written. This person also helps assemble the bows onto a paper plate, for those using the ribbon hat tradition. Have scissors and trash bags nearby the gift table. • Have someone on your wedding shower checklist assigned to give out the favors as guests are leaving, and to thank them for coming. *** Favors can also be placed on the tables, ahead of time, and used as part of the decorations.